Los Angeles - A high-grade issue of The Incredible Hulk #1 from May 1962 will be auctioned by Huggins & Scott Auctions from November 2- November 15. Interested bidders may participate in the auction online. This first issue is considered one of the most valuable and prestigious comics of the Silver Age. 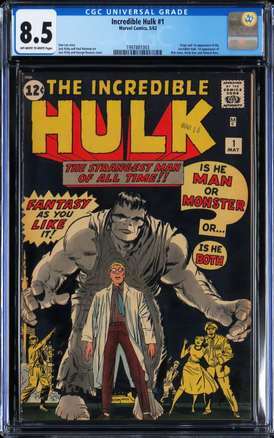 Marvel Comics published the inaugural issue of the Incredible Hulk in May 1962, which was part of an enormous resurgence of super-hero comics in the early 1960’s. This comic book earned a Universal Grade of 8.5 from the leading comic book grader CGC. The consignor read this 56-year old Hulk Comic once as a youth and kept it in storage since 1962. Well known to be a super tough comic to find in upper grades, this high-demand pivotal issue continues to show astonishing sale price increases, reaching a Fair Market Value of $175,000 in recent years for the few known examples that have been graded at the 8.5 level. Label notations include "Off-White to White Pages, Stan Lee story, Jack Kirby and Paul Reinman art, Jack Kirby and George Roussos cover, Origin and 1st appearance of the Incredible Hulk, 1st appearance of Rick Jones, Betty Ross and General Ross."